427 pages | 48 B/W Illus. 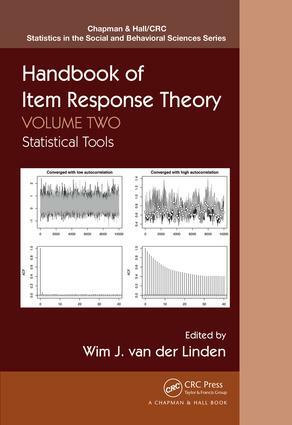 Drawing on the work of internationally acclaimed experts in the field, Handbook of Item Response Theory, Volume Two: Statistical Tools presents classical and modern statistical tools used in item response theory (IRT). While IRT heavily depends on the use of statistical tools for handling its models and applications, systematic introductions and reviews that emphasize their relevance to IRT are hardly found in the statistical literature. This second volume in a three-volume set fills this void. Volume Two covers common probability distributions, the issue of models with both intentional and nuisance parameters, the use of information criteria, methods for dealing with missing data, and model identification issues. It also addresses recent developments in parameter estimation and model fit and comparison, such as Bayesian approaches, specifically Markov chain Monte Carlo (MCMC) methods. Wim J. van der Linden is a distinguished scientist and director of research innovation at Pacific Metrics Corporation. He is also a professor emeritus of measurement and data analysis at the University of Twente. He is a past president of the Psychometric Society and National Council on Measurement in Education (NCME) and a recipient of career achievement awards from NCME, Association of Test Publishers (ATP), and American Educational Research Association (AERA). His research interests include test theory, computerized adaptive testing, optimal test assembly, parameter linking, test equating, and response-time modeling as well as decision theory and its application to problems of educational decision making. Dr. van der Linden earned a PhD in psychometrics from the University of Amsterdam.